Most people I think would agree that at least in the West. the glass ceiling stopping women getting to the top maybe hasn’t vanished but has at least huge gaping holes in it. Most big companies and organisations have anti-discrimination policies, and many go as far as having have quotas and other forms of positive discrimination. There are still some where women get a second class deal, but not many now. So assuming that the war is almost won on that front, what does the future hold for women in work? Well, mixed news I think, some good and some bad. Technology tends not to have all its impact in one lump, rather working over decades to accomplish its full impacts. Such it is with Artificial intelligence and robotics. Lots of manufacturing shop floor jobs have already been gradually replaced by robotics, with more impact to come, and many analytical and professional tasks will gradually be displaced by AI, with many others outsourced. Traditionally male-dominated jobs are being hardest hit and will continue to be, while gender neutral or female-dominated jobs such as policing, social work, sales and marketing, teaching, nursing etc will hardly be affected. Many of the men made redundant will be able to readjust and re-skill, but many will find it hard to do so, with consequent social strains. Just as power tools have reduced the economic advantage of being physically strong, so future AI will reduce the economic advantage of being smart. What is left is dominated by essentially emotional skills, and although the polarisation certainly isn’t complete here by any means, this is traditionally an area where women dominate. 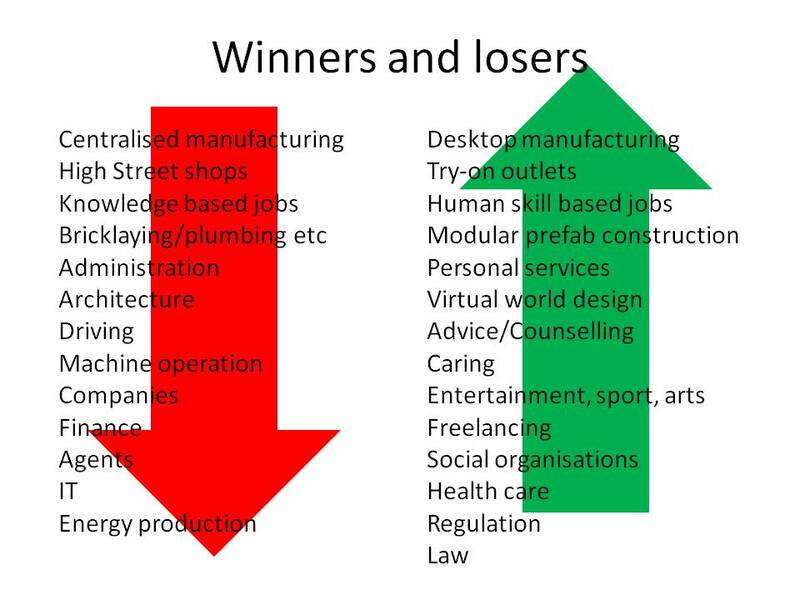 Looking at this over the whole spectrum, this pic shows some example areas likely to suffer v those that will flourish. Obviously I can’t list every bit of the entire economy. 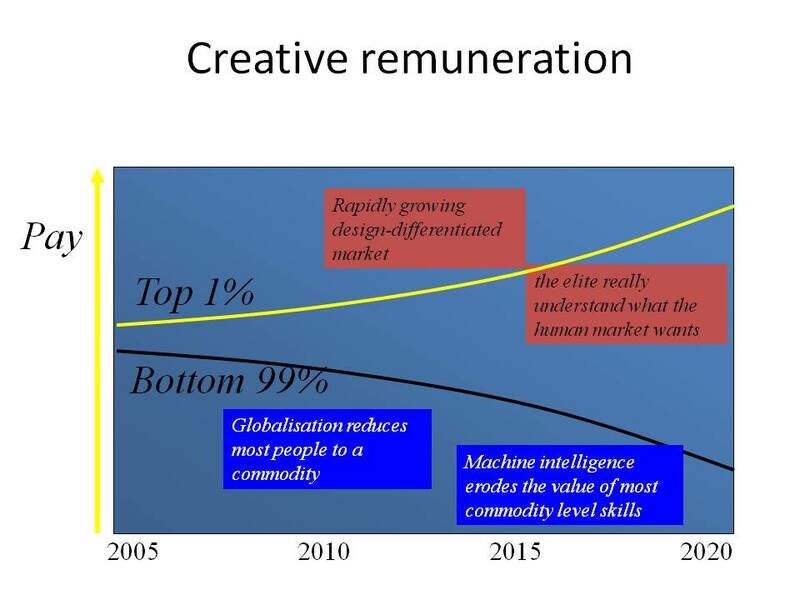 The consequences of AI are mainly influenced by the fact that few jobs are 100% information processing or intellect. Some is usually interpersonal interaction. Administrators will find that the pen-pushing and decision parts of their jobs will decline, and they will spend more of their time on the human side, the emotional side. Professionals will find that they spend more time with clients dealing with the relationship. Managers will spend more time on motivation, leadership and nurturing. Interpersonal skills, emotional skills, empathy, sympathy, caring, leadership, motivation – these are the primary skills human will provide in the AI world. 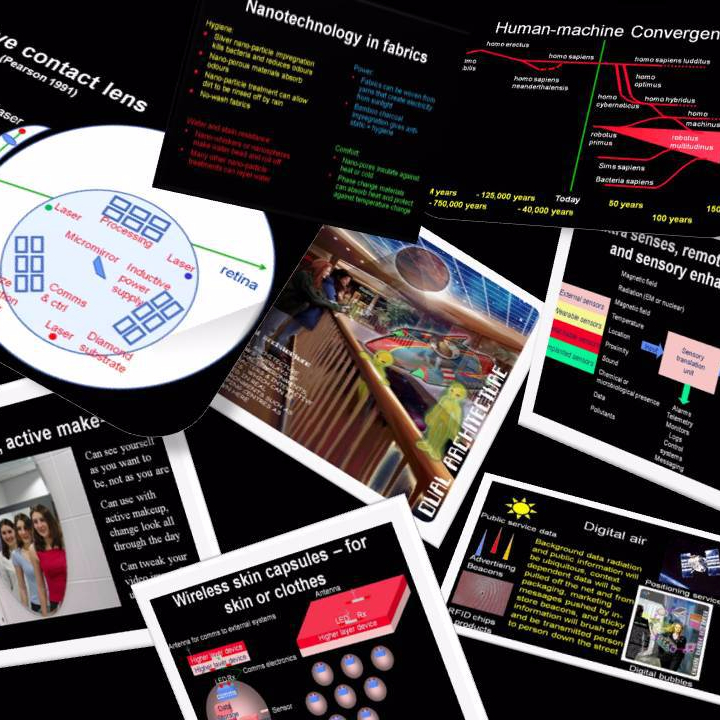 The information economy will decline and gradually be replaced by the ‘care economy’. 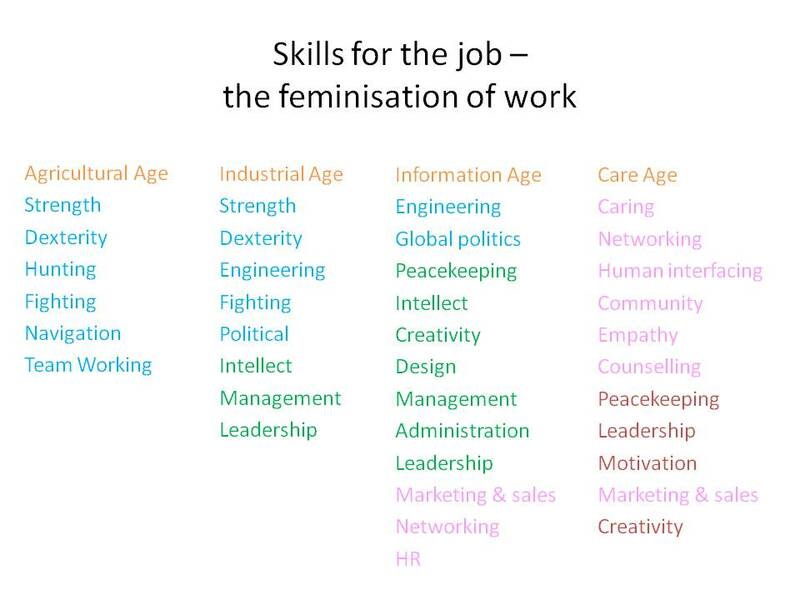 Although men can and do offer some of the skills in this list, it is clear that many are more associated with women, so the clear conclusion is that women will acquire an increasing dominance in the workplace. 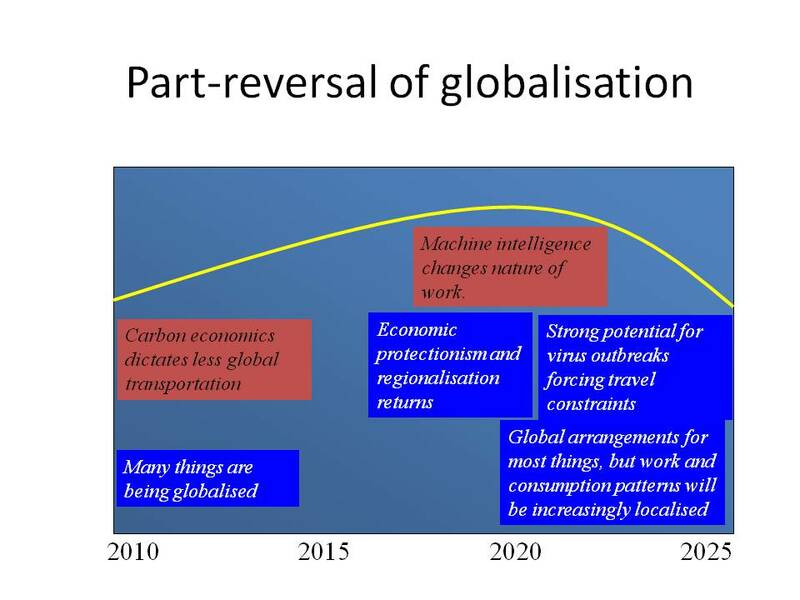 However, another consequence of the same forces is that globalisation of work will start to reverse in some fields, because if high quality human contact is essential part of the job, it is harder to do it from a distance. Some jobs require actual physical contact and can’t be done except by someone next to the customer. Looking at a diverse basket of forces, this is how it works out: Another trend in favour of women is that with increasing restructuring or businesses around small cooperatives of complementarily skilled people, networking is an increasingly important skill. Although women will generally have an easier time than men if emotional skills dominate, the evidence today is that most such work is not highly paid, so even though women will have less difficulty in finding work, it will not be high paid work. High end interpersonal skills such as senior management will fare better, but with extensive industry restructuring, there may be less need for senior managers. In spite of these trend that affect the vast majority of people, star performers aren’t affected in the same way. Although the markets are already depressing wage levels for groups where there is a lot of supply available, the elite are being rewarded more and more highly, and this trend will continue. The hard facts of life are that a very few individuals make a real difference to the success or failure of a company. The superstar designer, scientist, market analyst, manager or negotiator can make a company win. Letting them go to the competition is business suicide, so they justify and demand high remuneration. Sadly, 99%of us are outside the top 1%. Think about it. There are 70 million people in the global top 1%. Even spread across every sector, and ignoring those too young or old to work, that is stiff competition. Especially on a large scale, the marketplace is essentially gender neutral in the sense that customers generally don’t care whether a business is run by men or women (it certainly isn’t neutral in the mix of male and female customers for particular products and services of course). The market cares about marketing, price, quality, availability and location and a few other things. Gender has little impact. Companies can’t survive on the gender make-up of their staff, only results really count in the market. Turbulence in the market caused by rapidly changing technology, especially IT, accelerates levelling of the playing field by favouring new business models and adaptable companies and wiping out those that can’t or won’t adapt. By contributing to accelerating change, IT thus acts in accelerating the downfall of a patriarchal business environment in favour of one based purely on merit. It expedites the end of the war of women v men but when it runs to completion, women will play against men and against each other on a truly level playing field. Now that the glass ceiling is less of an issue, the battleground is moving on to appearance discrimination, which obviously links to age too. We now often hear older or plainer women complaining that the best jobs are going to pretty young things instead of the more experienced women who sadly have left their prettier days behind, especially in high profile media and customer facing jobs. A real world example illustrates the problem well. A while back, the BBC’s treatment of older women was ruled discriminatory by the courts because they had favoured attractive younger women to put in front of cameras over older, less attractive ones. However fair it might be, such a ruling puts the customer in conflict with the regulator. Although such a ruling may appear fair, actually all the female presenters lose, as viewers will simply swap channels to programmes hosted by presenters they want to watch. The trouble is that regulators can rule how companies must behave internally, but they can’t prevent customers from using their free choice what to buy. If some viewers prefer to watch attractive young news readers, they can and will. Those programmes hosted by less attractive ones will see a reduction in viewer numbers, and consequential drop in revenue from advertising on those programmes, or in the BBC’s case, just a drop in viewers. Unless the customer has no choice in what they watch, the courts can’t level the playing field. It isn’t just on TV that such discrimination occurs, but throughout industry. In male dominated areas, with mostly men at the top, attractive women will be favoured at interview time, and will then tend to dominate senior posts, so that quotas can be filled but men get to choose which women fill them. In airlines, it is hard not to notice if you fly frequently, that the most attractive stewardesses end up in first and business class, with the less attractive and older ones serving the economy cabin. And on a front reception desk, bar, sales jobs, and PR, attractive women have an obvious advantage too. It looks as if this issue is likely to dominate as we move into an economy where women as a whole have the advantage over men. And it will be much harder to legislate equality in this case. With the pension crisis growing daily, it is inevitable that people will have to work longer than today. Social skills tend to grow with age and experience in contrast with intellectual speed and agility and physical beauty, which tend to decline with age. This is a fortunate trend as it enables work to be done by older people at just the time that retirement age will have to increase. This entry was posted in business, Futurology, gender, management, Society, technology and tagged employment, gender war, women. Bookmark the permalink.